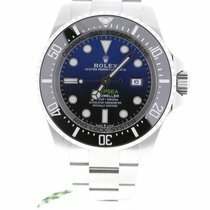 Rolex Sea-Dweller Deepsea "James Cameron"
The James Cameron Rolex is a special version of the professional Sea-Dweller Deepsea diving watch. 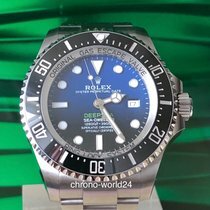 It is dedicated to James Cameron, the director of Titanic, and pays tribute to his expedition to the Mariana Trench with its blue and black dial. 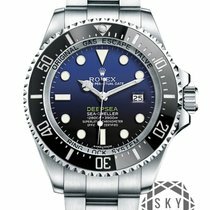 Hollywood director James Cameron received a special honor in 2014 when the luxury watch giant, Rolex, paid tribute the Oscar winner with his own model: the Sea-Dweller Deepsea James Cameron Edition with a D-blue dial. It was a brand first. While other Rolexes go by names like Paul Newman Daytona, Clint Eastwood, or Batman, these are all just nicknames given to them by fans and not officially approved by Rolex. The Deepsea James Cameron is the result of a collaboration between the filmmaker and the Swiss brand during Cameron's 2012 Deepsea Challenge expedition. However, Cameron was already a Rolex fan long before their professional relationship began. 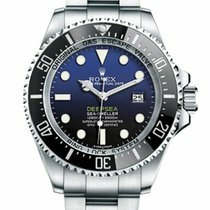 For his expedition, Cameron, Rolex, and National Geographic teamed up to develop a one-man submersible to explore the Challenger Deep, the deepest section of the Mariana Trench. Cameron piloted the craft solo and reached a maximum depth of 35,787 ft (10,908 m). This timepiece is the perfect tribute to this historic event. The gradient dial shifts from a rich blue to a deep black, just as the ocean gets darker the farther you are from the surface. What's more, the "Deepsea" inscription is the exact same shade of green as Cameron's submersible. 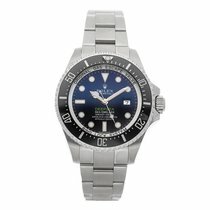 How much does the James Cameron Rolex cost? 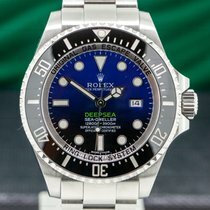 The original Deepsea James Cameron Edition D-Blue premiered in 2014 under the reference number 116660B. From a technological perspective, it is identical to the standard Deepsea ref. 116660 with a black dial from 2008. 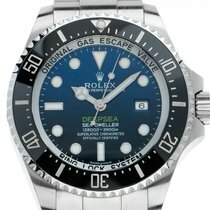 That means the James Cameron has the same stainless steel case with a helium escape valve. It measures in at a hefty 44 mm wide and 18 mm thick. The sapphire glass alone is 5.5 mm high. These proportions are due to the special Ringlock System case construction, resulting in a watch that is water resistant to an impressive 3,900 m (390 bar, 12,765 ft). Rolex uses their chronometer-certified in-house caliber 3135 to power these timepieces. This movement has proven its reliability time and time again in other models, such as the Datejust, Submariner Date, and Yacht-Master. It features a blue Parachrom hairspring and provides each watch with a date display and 48-hour power reserve. Plan to spend around 14,000 USD on a never-worn James Cameron Rolex ref. 116660B. Well-maintained pieces sell for about 11,000 USD. Rolex introduced an updated version of the James Cameron at Baselworld 2018: the ref. 126660. This timepiece looks very similar to its predecessor. It features the same D-blue dial but with longer minute and second hands. This extra millimeter means the hands' tips are now flush with the outer edge of the indices. The stainless steel case was also revamped. While it's still 44 mm in diameter and 18 mm thick, its lugs sit farther apart. This allows for a wider Oyster bracelet so that the watch sits even more comfortably on the wrist. The "Original Gas Escape Valve Ring Lock System" inscription on the inner bezel ring has also undergone an aesthetic change. It now uses the same font as the "Deepsea" inscription on the dial. However, the most important change occurred inside the case. Rolex has equipped the ref. 126660 with their in-house caliber 3235. This improved movement boasts 14 patented updates, including its Chronergy escapement, which is 15% more efficient. What's more, the barrel has a much thinner wall, making room for a larger mainspring. The gear train has also been heavily optimized. All of these changes combine for an increased power reserve of 70 hours. Prices for a mint-condition model sit around 15,500 USD. 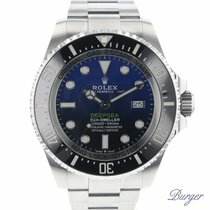 You can purchase a pre-owned watch for about 14,000 USD.